The speakers were excellent, have a lot of knowledge and kept our attention. PAINWeekEnd Regional Conferences are now in their 6th year! PWE Oklahoma City on April 9 will provide busy clinicians and allied healthcare practitioners with relevant, practical instruction in the management of chronic pain. The conference, offering continuing medical and clinical pain education, will take place at the Renaissance Oklahoma City Convention Center Hotel, 10 N. Broadway Avenue. In Oklahoma requires medical doctors to complete 60 hours of CME credit every 3 years in order to be relicensed; DO requirements are 16 hours every year. 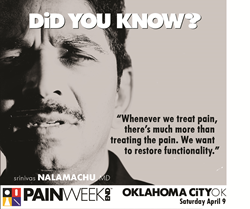 By attending PAINWeekEnd Oklahoma City, participants can receive 6.0 CE/CME credit hours as they enhance their skills in medication risk evaluation and mitigation, pain assessment and diagnosis, and delivery of individualized multimodal treatment. Course topics include chronic pain assessment; the complex pain patient; regional pain syndromes: hip/knee and neck/back; when acute pain becomes chronic; and cost containment. In addition, there will be commercially supported activities addressing a range of product, disease state, and medical information topics. To see the complete agenda, and more information about this or other PAINWeekEnd Regional Conferences, go to painweekend.org.